In Rome, American diplomat Robert Thorn (Gregory Peck) is in a hospital where his wife Katherine (Lee Remick) gives birth to a boy, who—he is told—dies moments after being born. Robert is convinced by the hospital chaplain, Father Spiletto (Martin Benson), to secretly adopt an orphan whose mother died at the same time. Robert agrees, but does not reveal to his wife that the child is not theirs. They name the child Damien (Harvey Spencer Stephens). Then, Robert is appointed U.S. Ambassador to the United Kingdom. 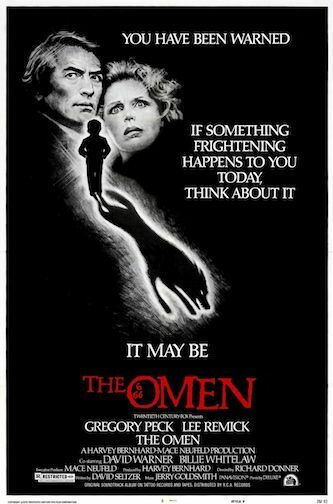 Mysterious events plague the Thorns: large black dogs congregate near the Thorn home; Damien's nanny publicly hangs herself at his fifth birthday party; a new nanny, Mrs. Baylock (Billie Whitelaw), arrives unannounced to replace her; the five-year old Damien violently resists entering a church; and zoo animals are terrified of Damien. Read more on Wikipedia.